Schönbrunn Palace is one of Austria’s largest Rococo buildings; each year millions of people visit the internationally recognized world heritage site. Admire the luxurious decor of the apartments belonging to Franz Jozeph, Maria Theresa and other Austrian aristocracy. Then take a stroll in the vast Baroque park behind the palace. Children will love the 18th-century maze and zoo. 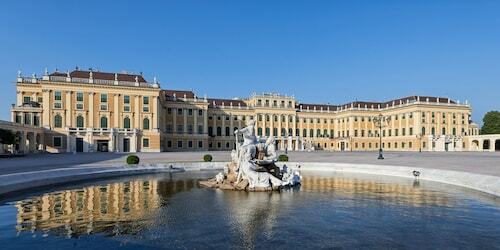 The 300 acres (120 hectares) that make up Schönbrunn Palace and grounds belonged to the Hapsburg family for six centuries. Emperor Maximilian II acquired the grounds for hunting purposes and Leopold I commissioned the grand palace. Further additions to the original Baroque structure were made during the reign of Maria Theresa, Austria’s 18th-century empress and mother of Queen Marie Antoinette of France. Step back in time by joining a tour, a requirement if you want to look inside the palace. Of the 1,441 rooms, 40 are open to the public. Tours are varied; you can opt to see all rooms or just selected highlights. Peer into the Millions Room and admire the porcelain decoration of the Chinese Cabinet. Stylish frescoes, priceless furniture and numerous special artifacts adorn the other accessible rooms. Spend a few hours wandering the gardens and relax near one of the fountains. For excellent views, head to the Gloriette built atop a small hill. Buy a cold drink at its café as reward for the climb. Nearby you’ll find a mock Roman ruin, planted with decorative flowers. Children love the on-site Schönbrunn Zoo. Opened in 1752, this is the oldest continually running zoo in the world. Take the family to the royal maze. Once you’ve found your way out, enter the Palm House to see some of the largest indoor cultivated palms in the world. Schönbrunn Palace is located four miles (six kilometers) from central Vienna and is easily accessible by public transportation. The estate is open daily and entry is free, but you pay admission for the palace, the zoo and some other attractions. Spot statues of famous composers, admire exquisite architecture and visit a historic music hall set amid the grassy lawns and woods of this city center park. Hop between continents at one of the world’s oldest zoos and visit creatures from the African savannah to the mountains of Siberia alongside 18th-century buildings. Statues, fountains, gardens and museums decorate this stately public square dedicated to the first and only female monarch of the Habsburg Empire. Explore the splendid building where the Austrian parliament has convened since the time of the 19th century emperor Franz Joseph. See Roman ruins, visit the Hofburg Imperial Palace and spot Renaissance frescoes at an ancient church at this beautiful Old Town square. Enjoy sweeping city views and a romantic candlelit dinner while sitting in the comfort of a gondola on this century-old Ferris wheel. A mosaic replica of Da Vinci’s Last Supper and a stone statue of the Madonna are among the many treasures of this 13th-century church. Explore chronological exhibits that detail Austria’s dramatic military history spanning the 16th to the 20th century within this richly decorated museum. Giant crystals, dinosaur skeletons and an incredible animal specimens will amaze and educate you at one of the most important natural history museums in Europe. Housed in a spectacular Baroque building within the Hofburg Palace, the National Library contains four museums and the largest collection of books in the country. Pay homage to Beethoven and Brahms and see the graves of many more of the world’s great composers at one of Europe’s finest cemeteries. Inspiring designs, religious artworks, intriguing legends and great views are featured in the city’s prominent Gothic building, the seat of Vienna’s archbishop. See masterpieces by Klimt, Monet, and Van Gogh and enjoy exceptional city views at this former imperial complex with gardens, stables and two Baroque palaces. See a performance, visit the nearby opera museum or simply admire the architecture in one of the world’s most revered opera houses. See original works by Rubens, Monet, Picasso, Rembrandt and many more in this lavish Habsburg residence in Vienna. This architecturally unique edifice has splendid frescoes and altars under its magnificent dome. It also houses a small museum. Admire the ornate Renaissance facade, marvel at frescoes by the two Klimts or catch an actual performance at Vienna’s premier theater. Ride the famous Ferris wheel or a roller coaster at one of the longest-running amusement parks in the world or simply enjoy a walk in the surrounding park. Browse splendid museums and opulent rooms and visit theaters and equestrian shows in this historic residential estate of the powerful Habsburg dynasty. Browse paintings by European master painters, examine a fascinating coin collection and see remnants of ancient civilizations in this impressive fine arts complex. In this tiny city square you’ll find one of Vienna’s most elaborately decorated Baroque churches on a site that has been revered since the 4th century. Shop at boutique stores and high-end chains. Then relax at the cafés along the sidewalks of this lively commercial avenue. Stately rooms, grandiose architecture and fun public events make this government building a must-see when you are in the Austrian capital. Stroll around the peaceful 19th-century court gardens of Emperor Franz II and visit monuments and greenhouses that retain the park’s historic charm. Located in Hietzing, this luxury hotel is within a 15-minute walk of Schoenbrunn Zoo and Schoenbrunn Palace. Schoenbrunn Bad is 0.9 mi (1.5 km) away. Hietzing U-Bahn is only a 3-minute walk and Braunschweiggasse U-Bahn is 10 minutes. 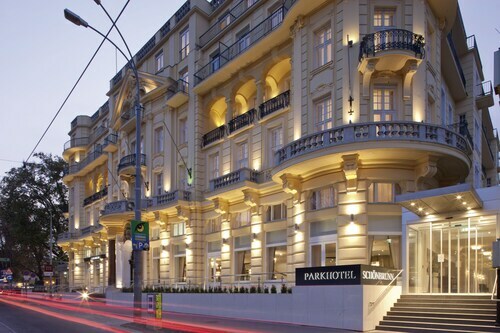 Located in Penzing, this luxury hotel is within a 10-minute walk of Vienna Technical Museum and Schoenbrunn Palace. Schoenbrunn Zoo and Stadthalle are also within 2 mi (3 km). Schonbrunn U-Bahn is 12 minutes by foot and Penzing S-Bahn is 13 minutes. 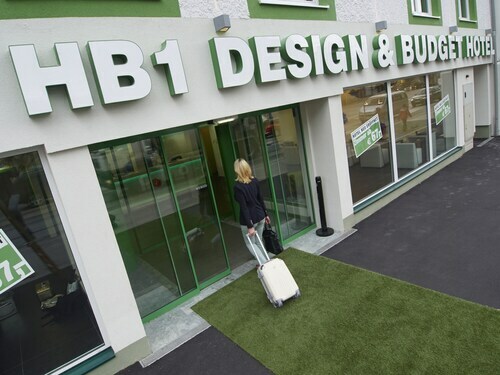 Located in Penzing, this hotel is within 1 mi (2 km) of Vienna Technical Museum and Schoenbrunn Palace. Wiener Stadthalle and Raimund Theater are also within 3 mi (5 km). Penzing S-Bahn is 9 minutes by foot and Braunschweiggasse U-Bahn is 12 minutes. 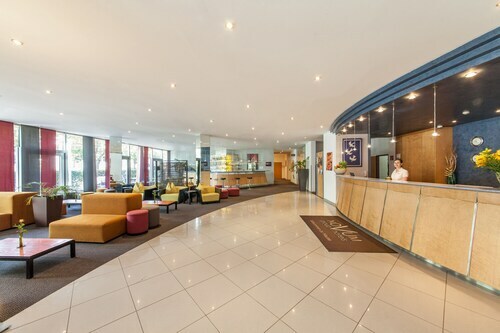 Located in Meidling, this hotel is within 1 mi (2 km) of Vienna Technical Museum, Schoenbrunn Palace, and Raimund Theater. Wiener Stadthalle and Naschmarkt are also within 3 mi (5 km). Meidling Hauptstrasse U-Bahn is only a 2-minute walk and Niederhofstrasse U-Bahn is 6 minutes. Located in Hietzing, this luxury apartment building is within 1 mi (2 km) of Vienna Technical Museum and Schoenbrunn Palace. Wiener Stadthalle and Raimund Theater are also within 2 mi (3 km). Schonbrunn U-Bahn is 8 minutes by foot and Hietzing U-Bahn is 9 minutes. 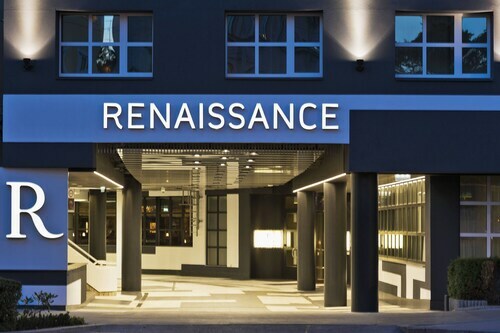 Located in Penzing, this hotel is within a 10-minute walk of Vienna Technical Museum and Schoenbrunn Palace. Wiener Stadthalle and Raimund Theater are also within 2 mi (3 km). Penzing S-Bahn is 11 minutes by foot and Schonbrunn U-Bahn is 13 minutes. Located in Hietzing, this hotel is within a 15-minute walk of Schoenbrunn Zoo and Schoenbrunn Palace. Wiener Stadthalle and Raimund Theater are also within 3 mi (5 km). Hietzing U-Bahn is 5 minutes by foot and Braunschweiggasse U-Bahn is 8 minutes. 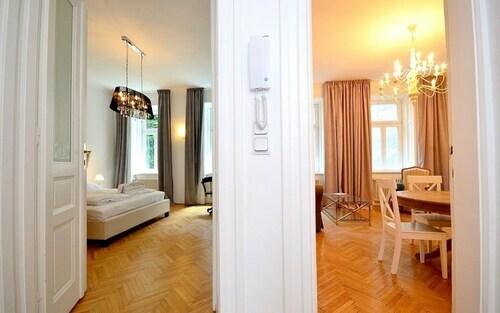 Located in Hietzing, this apartment building is within 1 mi (2 km) of Vienna Technical Museum and Schoenbrunn Palace. Wiener Stadthalle and Raimund Theater are also within 2 mi (3 km). Schonbrunn U-Bahn is only a 4-minute walk and Hietzing U-Bahn is 11 minutes.